Download your copy today using the link above. The calendar is available in multiple languages. Where will your child attend school for 2019-20? School assignments are happening now. Visit www.ousd.org/enroll today! 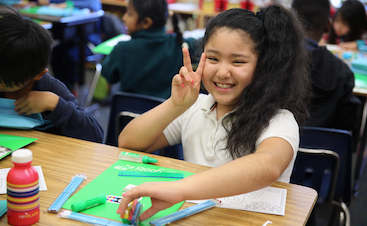 Learn more about our vision for a brighter future for all Oakland students. 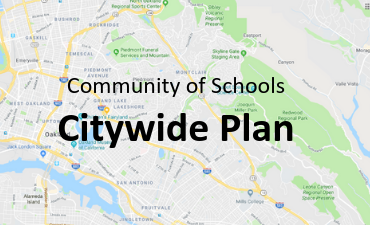 Use the link above or visit www.ousd.org/citywideplan. 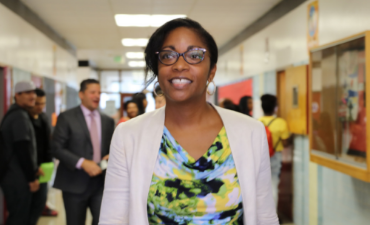 Use the link above to read the latest community messages from our Superintendent, Kyla Johnson-Trammell. 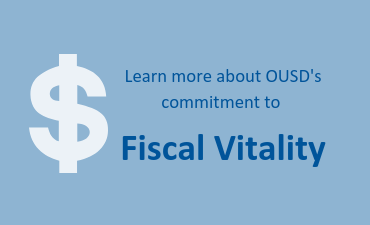 Use the link above to learn more about the work of the Special Committee on Fiscal Vitality and our Fiscal Vitality Plan. Did you apply on-time (by Feb. 8, 2019) for the 2019-20 school year? 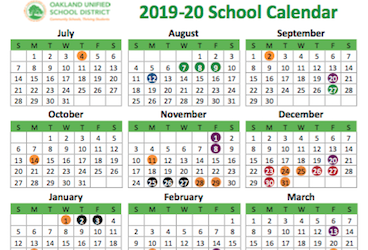 OUSD school offers and waitlist assignments were available starting on March 14, 2019. The deadline to accept or decline your student's offer was Tuesday, April 2, 2019. Starting April 3, 2019, waitlist assignments for families that did not accept or decline an offer were also cancelled. This is done to clear space for students who are on waitlists and who have indicated in the last three weeks that they are still interested in attending an OUSD school. What to do if your student's offer / waitlist placement has been cancelled? Come to the Student Welcome Center to complete a late application. Have questions? Please see answers to FAQs and/or contact the Student Welcome Center for assistance. Did you submit a late application (after Feb. 8, 2019) for the 2019-20 school year? The Student Welcome Center will contact you when a school assignment is offered. Still need to apply for a school for 2019-20? Come to the Student Welcome Center to complete a late application. The East Oakland (Lockwood) Student Welcome Center located at 1125 69th Avenue is closed indefinitely as of July 2, 2018. Please visit our Lakeview location at 746 Grand Avenue.